I know. you want a better answer. But, there is a logic to the response. The most important determining factor on the need for x-rays is the HISTORY. By telling your Doctor the reason for the visit, your Doctor will determine if there is a benefit to ordering the X-ray. Let me give you a hypothetical scenario. What if you are a healthy 30 year old man, with no history of back problems. Yesterday, you helped a friend move into his/her new apartment. During the move, you felt a bit sore, but after your friend offered a thank you beer, you felt fine. This morning, you experienced a mild back ache. Should you see a doctor and get an x-ray? I think most people would opt to give it a bit more time to see if the soreness will naturally go away. 99% of the time it will. The answer to the question is NO, you do not need to see your Doctor or get an X-Ray. In the second hypothetical scenario, You are a 65 year old woman with a history of osteoporosis (brittle bones), and you tripped and fell on your front porch. You have immediate sharp pain to the middle of the back. You have pain whenever you inhale, and it is difficult to walk without pain. In this scenario, you should certainly contact your physician, and if he/she is not available, you might consider making a visit to a walk-in clinic or an emergency room. By history, there is a strong potential for what is known as a compression fracture. If warranted, your Doctor may get an x-ray to confirm or rule-out this possibility. By these examples, you can see how the history is very important in determining the needs for tests such as x-rays. X-rays should be ordered if there is suspicion of a broken bone, a dislocation, or in rare instances, as a screening test for potential cancer or infection. Beyond those problems, spinal x-rays rarely help in the diagnosis or treatment of the typical episodes of neck and back pain. I know many of you will say, “But my doctor discovered I had spine arthritis with the x-ray.” The statistic is that after 40, almost all of us will have some evidence of arthritis of the spine based on x-rays. The better question is, does the x-ray discover of spine arthritis change the treatment plan for the average patient? As you can guess, the answer is no. Often times, x-rays will demonstrate the early disk degenerations and bone spurs of aging. I like to make the relationship of balding or greying hair. We all get it eventually. The x-rays findings of degeneration of the spine is like the visual effect of seeing our greying or balding hair. It happens. You cannot reverse it. And, just because you see arthritis on the x-ray, it does not mean that the arthritis is the cause of your neck or back pain. Face it. 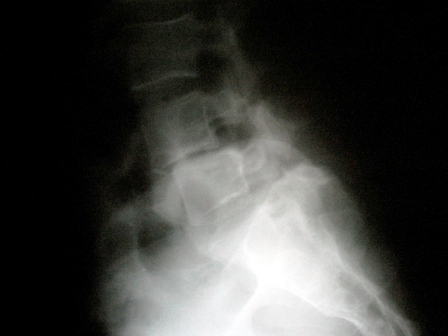 X-rays for neck and back pain are not helpful in the vast majority of patients. X-rays should be reserved for situations where we suspect a broken or dislocated bone. Even in the face of infection or cancer, the x-ray is just a general screening tool, and if there is strong suspicion, more that just an x-ray is necessary. The usual scenario that I see as a spine surgeon is the patient has back pain. The patient has expectation of testing, so the x-rays are ordered by some one. By the time I see the patient, often times the pain is vastly improved, and the patient needs some basic counseling on exercise, use of NSAID medications, weight management and smoking cessation. The x-ray usually did not reveal anything other than arthritis. Every once in a while, there will be a patient that has a significant finding, unrelated to their back pain, discovered on x-ray. That patient will point out how that x-ray discovered the problem. But the truth is, that problem, if significant enough, will be discovered anyways. So why am I trying to convince you that x-rays are not always necessary? Because there are also risks of x-rays. X-rays of the lower back subject you to the equivalent about 80 chest x-rays. X-rays findings can often lead to costly and time consuming over-treatment of findings. X-ray findings can also mislead you on the real diagnosis. If you have neck or back pain, give your Physician a thorough and accurate history of this episode of pain. Then he/she will determine the need for additional testing. If the pain does not go away within 4-6 weeks, it is likely that your physician will refer you to a specialist, or order screening tests to make sure you do not have a more serious condition. But, if your Physician does not order an x-ray immediately, maybe it is because your Physician thinks it will go away, without subjecting you to all the risks of an x-ray. Maybe your Physician is not testing you on purpose. Maybe your Physician thinks the risks of x-rays are not necessary. Maybe your Physician is just being a good Physician. Ask him/her about it.